This year I had the pleasure of throwing my mother a surprise 55th birthday party. Since her nickname is has been Bebe for years I thought it was the perfect time for a bee themed bash. 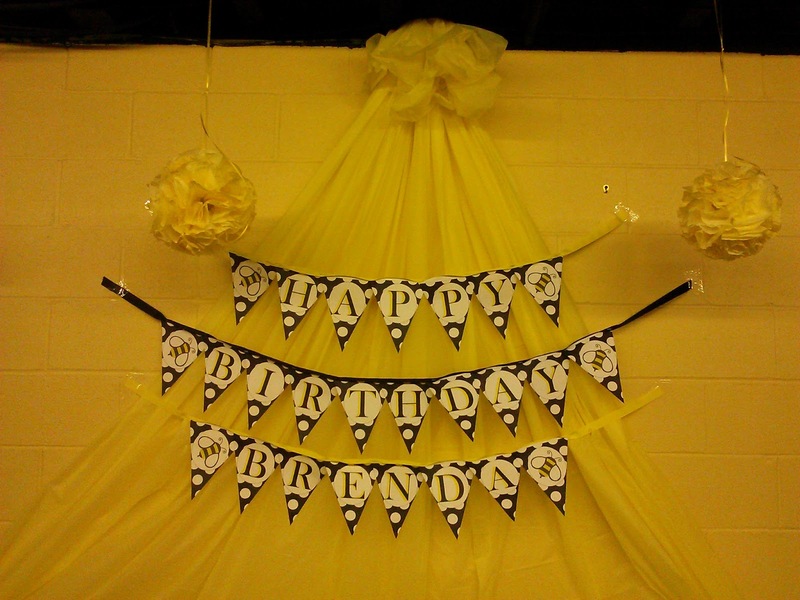 I found some great decorations at birthdaydirect.com that gave me a great start. This custom sign was one of the items I ordered through birthdaydirect.com. 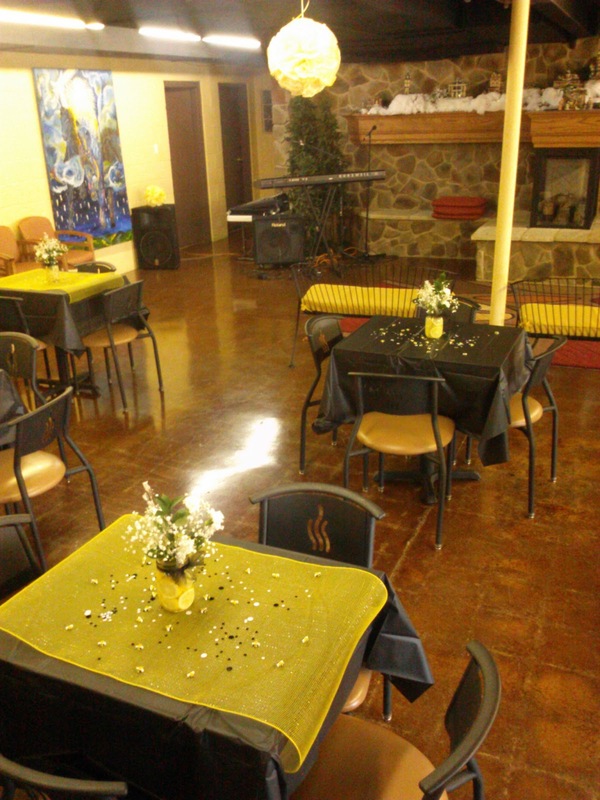 It was the first thing that guest saw after walking through the door. Another view of the custom sign along with a posterboard bee I made to match. 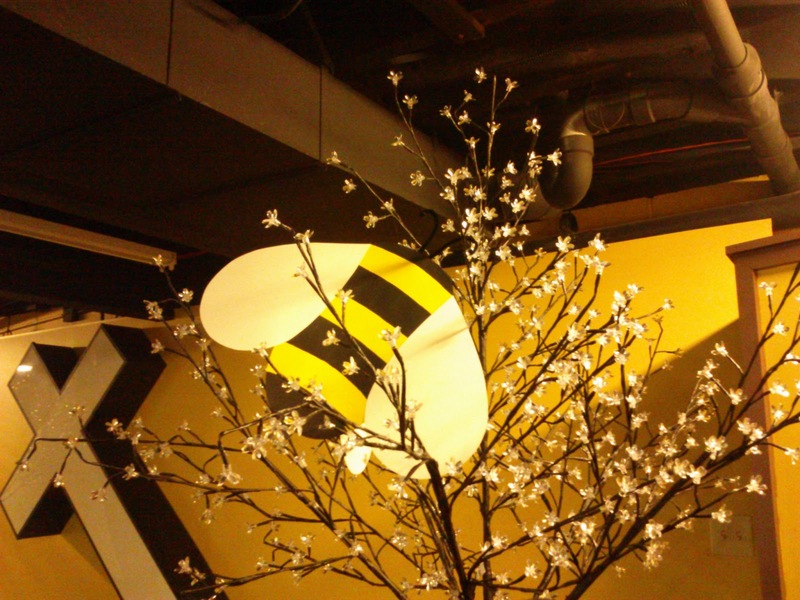 A closer look at the poster board bees I made from yellow and white poster board with black paint and pipecleaners. 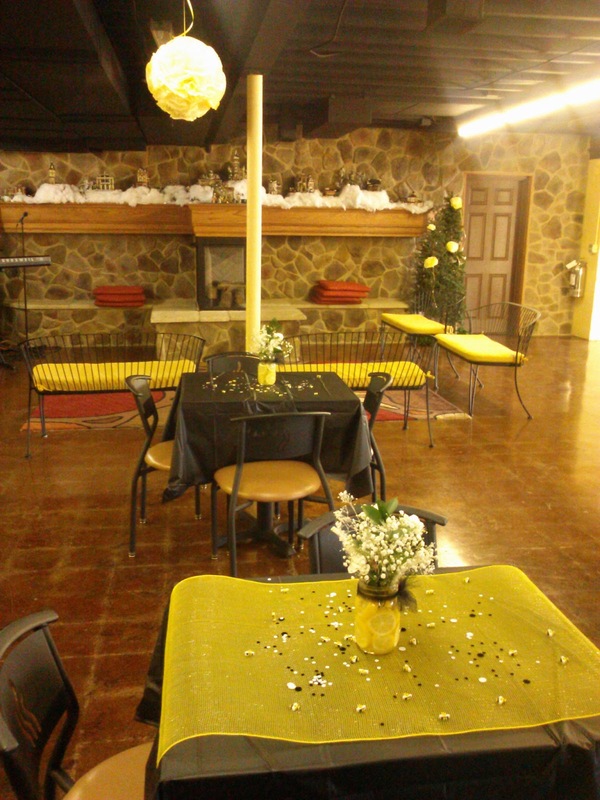 I made the cake table one of the main focuses in the room. 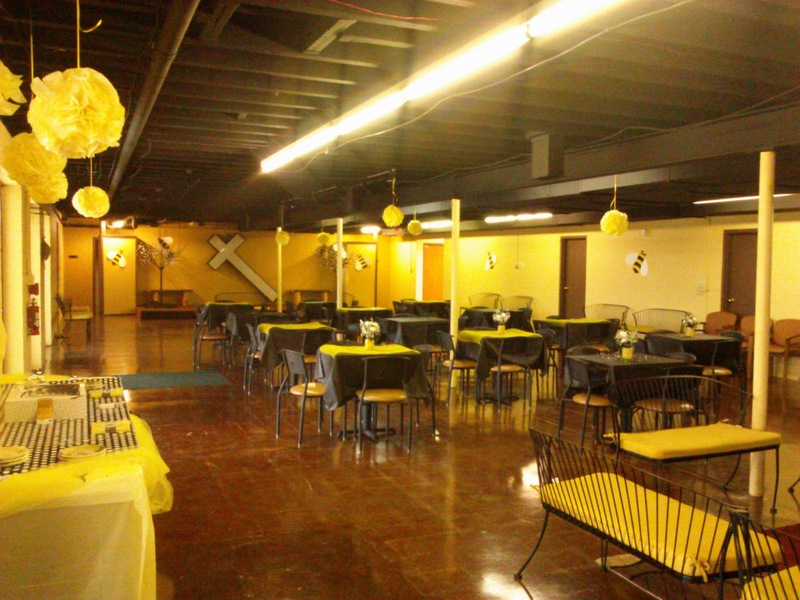 I started off with three yellow plastic table clothes. One was taped along the edge of the table as a skirt, one was placed over the table and the last one was bunched together at one end then hanging on the wall and fanned out with double sided tape above the table to cover the wall. I made paper pennants on the computer, printed them, then stapled them to ribbons. The pennants were printed in black and white then I shadowed the letters with a yellow highlighter to bring in some color. I also colored the bees with the same yellow highlighter. 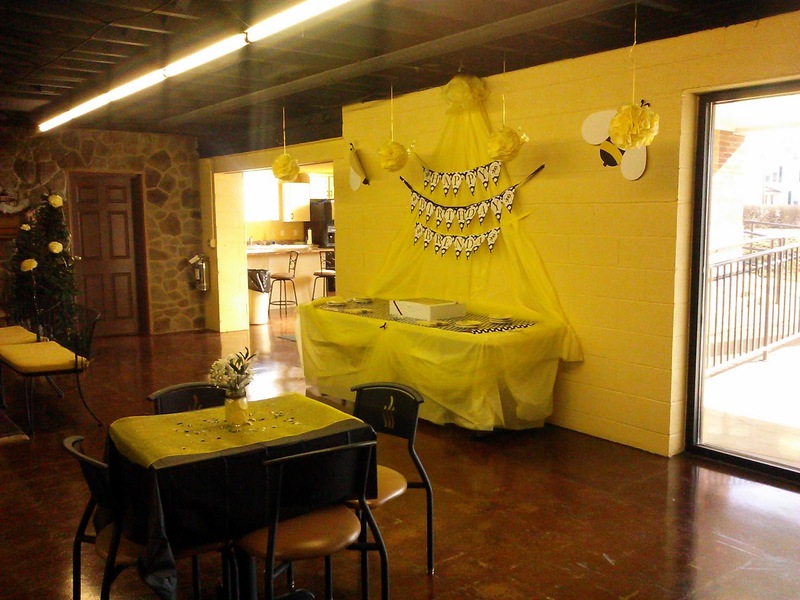 The hanging yellow puffs were created from dyed coffee filters. I had them hanging from the ceiling all over the room. 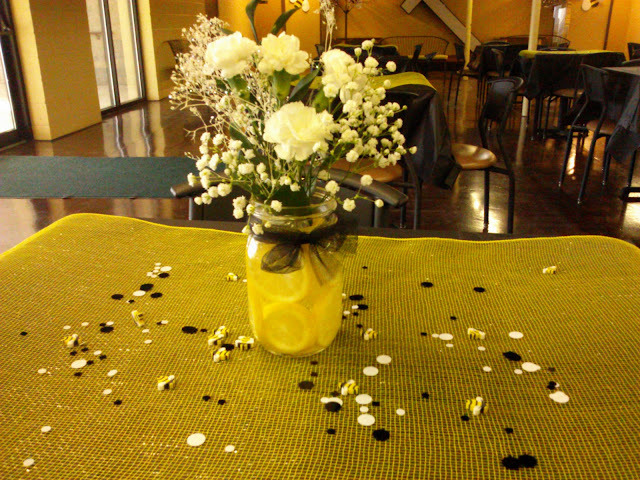 Yellow tulle added a softer touch around the table. The top of the table was covered with dotted wrapping paper (yes, wrapping paper!) that I found at Hobby Lobby that matched the decor perfectly. I love to make my own cakes, but I decided to leave this one to Kroger's Bakery. The scanned a napkin and put it on the cake along with "Happy 55th Brenda". I had them add the black and white dots to tie everything in and it turned out great! The centerpieces were pinterest inspired. Mason jars lined with lemon slices, filled with flowers and adored with black tulle bows. 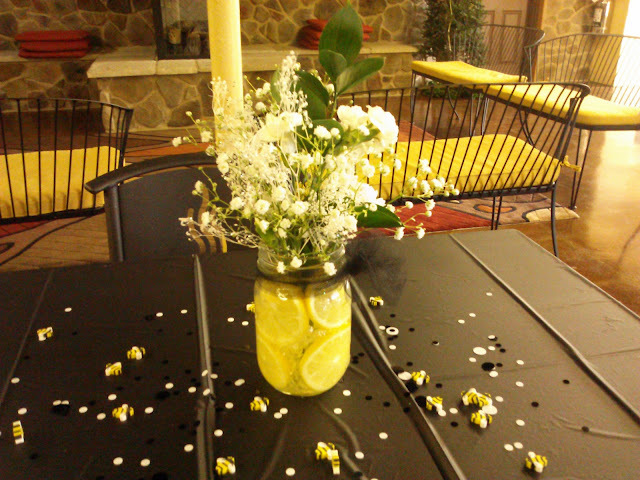 Each table was sprinkled with black and white dot confetti and tiny bee erasers. 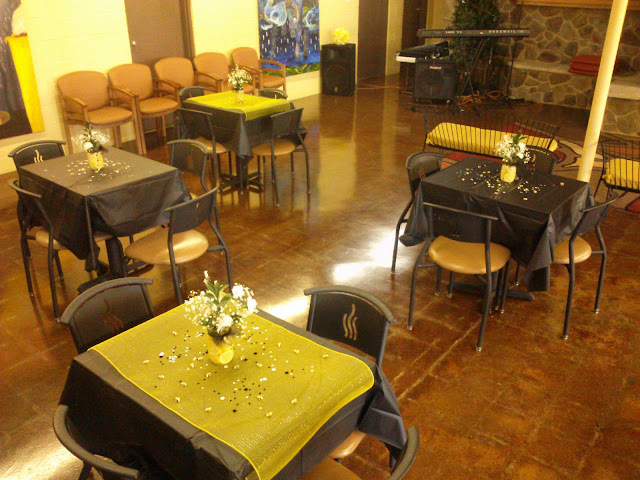 All tables were covered with black plastic table clothes. 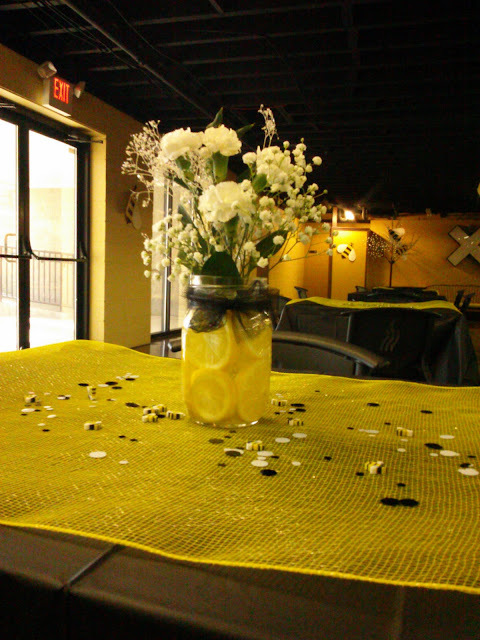 Every other table had yellow mesh to bring in more color. What do you think? Did you like the party?